Police are investigating a possible hate crime after offensive comments were found scrawled outside a mosque and community centre in Thornhill. York Regional Police responded to a vandalism call shortly after 7 p.m. Sunday night at the Jaffari Community Centre on Bathurst Street, near Rutherford Road, where they found “messages of a hateful nature” spray painted on the sidewalk, as well as symbols spray painted on a sign in front of the centre, they said in a press release. The messages were related to the ongoing conflict in Gaza between Israel and Hamas. 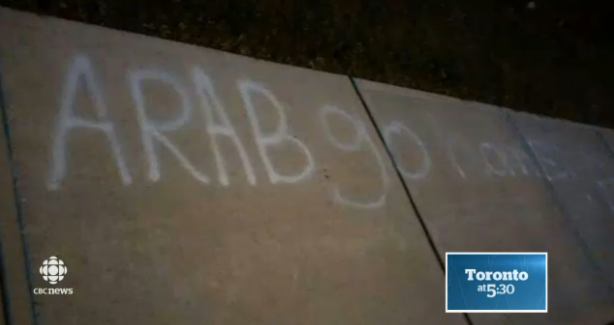 One of the phrases read “Arab go home” while another contained profanity. CBC reporter Linda Ward says the messages were discovered Sunday night as people arrived at the centre for an event marking the holy month of Ramadan. The sidewalk has since been powerwashed. Police are canvassing the area again today and looking at surveillance footage to find who may be responsible.